Who can use these Photographer Terms of Business? These Photographer Terms of Business are for use by a photographer who wants to have a document that clearly sets out the terms and conditions on which he or she takes on work for a client. What are these Photographer Terms of Business for? Our template includes a Project Form with details of the photography assignment, type of photos, fees etc. to be completed and signed, to evidence the contract. There is a one-page small-print version of the Terms of Business (which can be printed on the back of the Project Form if required) as well as standard A4. For the photographer, apart from being clear on the scope of the project and payment terms, he/she will most likely want to retain copyright in the images, while the client has a licence to use those images. Sometimes the client will want copyright, but if agreed, it should be conditional on all payments due to the photographer being made before copyright is released. The terms of business may also limit the photographer’s liability, not least in a force majeure situation – e.g. if images are lost in transit via email or if the photographer’s equipment is damaged. 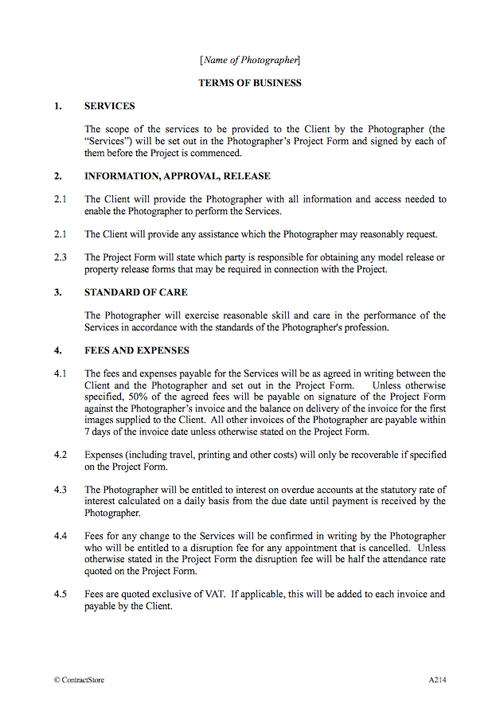 As with most creative contracts, the photographer will be sensible to get a down payment when booked for an appointment. And if substantial travel or overnight accommodation is needed, these costs may be recoverable in certain circumstances. What detailed terms does the Terms of Business contain? We also recommend our Model Release Form. 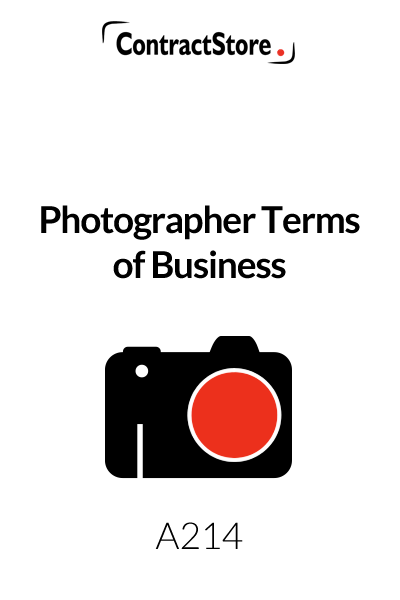 These Terms of Business comprise a set of standard terms for use by a photographer. They are supplied with a ‘Project Form’ which will set out details of the assignment including the fees payable. The contract will consist of the completed Project Form, signed by the photographer and the client, and the Terms of Business. Any change to the Terms of Business which might be agreed should be recorded in the Project Form. The Terms of Business can also accompany the photographer’s proposal for services to a prospective client. 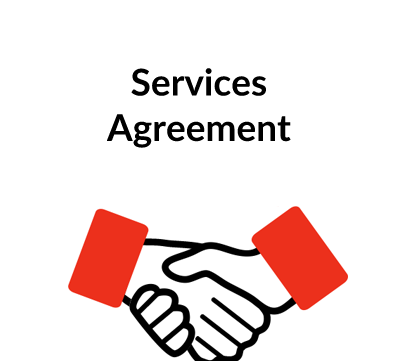 Our documents include a one-page version of the Terms of Business which may be of interest to professional photographers who want to minimise the amount of legal/contractual documentation. The precise scope of the services will be covered in the Project Form. 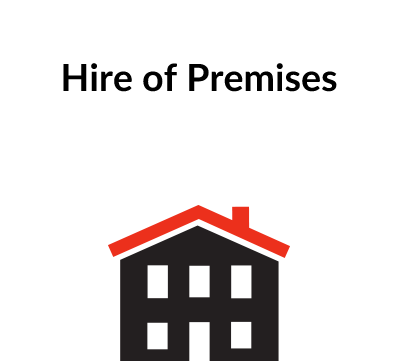 This makes it clear that the Client is responsible for providing any information or assistance required by the Photographer, including access to property. Under 2.3 there is a reference to the model release form or property release form which may be required. The purpose of such a form is to get consent from individuals who are being photographed or from the owner of property being photographed for the use of those pictures. ContractStore has a Model Release Form on its website. Fees and expenses will be set out in the Project Form and these Terms of Business set out the standard payment arrangements as well as dealing with out of pocket expenditure, price adjustments (in the event of a change to the services) and payment of interest on overdue accounts. Our clause proposes interest at the statutory rate: in the UK, if the contract does not specify an interest rate, the law allows an unpaid party to a contract to claim a high rate – 8 per cent above Base Rate under the Late Payment of Commercial Debts (Interest) Act 1998. If the Client wants to change any of the services or any dates, then this has to be agreed and confirmed in writing by the photographer. This, in effect, provides for two options: unless the Project Form specifies otherwise, the Photographer will retain copyright and intellectual property rights in the images which he produces and the Client has a licence to use those documents. Often the Client will want to own the intellectual property rights and this can be dealt with in the Project Form. In this case, transfer of ownership of the intellectual property rights conditional on the Client complying with his obligations with regard to payment of fees. This is never an easy subject. As will be seen, this paragraph requires the Photographer to remedy defects for which he/she is responsible where this is feasible. It also limits the Photographer’s liability to an amount equal to the fees. In addition the Photographer’s liability excludes any indirect or consequential loss of the Client such as loss of profits. Legal advice on the question of liability is recommended. This makes it clear that the Photographer may terminate if the Client commits a material breach – in particular if he does not pay fees and expenses when they are due. It also gives the Client the right to terminate if the Photographer commits a material breach. Each of them is also entitled to terminate if the other becomes insolvent. 8.2 makes it clear that the Photographer is entitled to all fees and expenses up to the termination date and he maybe entitled to claim cancellation fees. This is a phrase used by lawyers and refers to circumstances beyond the control of a party to the contract. Here we make it clear that neither party is in breach of their obligations if this is due to illness or injury and this also applies to the photographer if his equipment fails or some other extraneous cause prevents him from performing the services. This clause has a few standard provisions dealing with how notices under the contract have to be given as well as assignment or subcontracting (which are prohibited). For a Photographer wanting freedom to sublet any services, this clause would need amendment. In addition the clause makes it clear that the contract consists of the Terms of Business and the completed Project Form. We assume here that these Terms will be governed by English law with the courts finally resolving any dispute. Clause 11.3 suggests the possibility of mediation, but as written, it would need the consent of both parties. This form contains a lot of blank spaces which need to be filled in and then the form should be dated and signed by the Photographer and the Client. 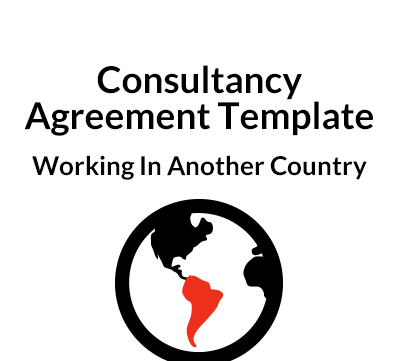 We recommend that two copies are prepared and signed, with one copy retained by each party as the form is the document that evidences the contract and which contains all the important terms including fees. It is important for the Photographer to ensure that the services are clearly defined so that scope for argument as to whether or not additional services are being requested can be avoided.